Cables are an essential part of any industrial application. Therefore, it is important to make sure to choose the appropriate cable material for the environment, especially where chemical cleaning solutions, cutting fluids, and other caustic liquids are present. The two main types of cables used in industrial applications are either PVC or PUR, and they are each suited to different types of environments. This article describes the difference between PVC and PUR cables and when to use them. It is also important to take into consideration the concentration of chemicals, temperature of the process, and the duration and frequency of exposure, since these factors can impact the suitability of PVC for these applications. Furthermore, PVC has limited resistance to oils, making it less suited for automotive and machine tool industries. In addition to being resistant to common cleaning chemicals, PVC cables are generally more rigid than other types of cables. This makes them suitable for use in applications where they will be exposed to high temperature, high pressure washdown as the rigidity of the sheathing protects the cable from damage. A PVC cable with IP69K rating means it is sealed against the ingress of water even during washdown. However, the rigidity of PVC cables can be a disadvantage in freezer applications, where low temperatures can cause the material to crack if the cables are flexed. Discuss specific applications with an expert to determine the best cable material in these circumstances. PUR (or polyurethane) is a thermoplastic material used for cable jackets. Since PUR cables are resistant to cutting fluids, oils, and other harsh chemicals, they are a good choice for many automotive manufacturing, stamping and machining applications. PUR cables also have high tensile strength, tear and abrasion resistance. They are also extremely flexible, with a small bend radius. 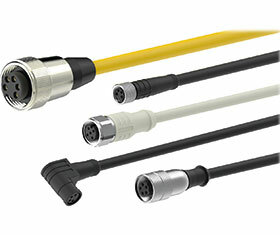 This makes them ideal for applications where connections move or bend frequently, such as robotic applications.